The Stables is a beautifully restored 19th Century stone self catering cottage, located on a 100 acre working farm in Foxford, Co Mayo. 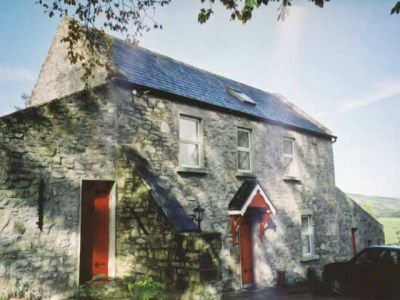 The Cottage has 4 ensuite bedrooms and can sleep up to 8 people.Located in a peaceful, rural setting, The Stables is a perfect base from which to tour the counties Mayo, Sligo and Galway, and the wider west coast of Ireland. It is situated on a 100 acre, working farm and visitors can enjoy superb views over the surrounding bogland, lakes mountains while relaxing in serene surroundings.The Stables has been lovingly restored and refurbished to the highest standards to create a comfortable and cosy selfcatering cottage. The cottage has 4 bedrooms – all of which have ensuite bathrooms – one double bedroom, two twin bedrooms and a bedroom with single bed and pull out bed. (Three of the bedrooms are located on the ground floor ).The open plan living area has a fully equipped kitchen with oven and hob, microwave, fridge freezer, dishwasher, washing machine and tumble dryer, and dining table, while the living area is comfortably furnished with TV and open fire place. There is also a bait, tackle and freezer room. Electric blankets are also supplied. This family friendly cottage also has a childrens playroom. Located 30 minute drive from Enniscrone Beach ( 3 miles of Beautiful Sandy Beach ). Outside peak months (June – August) the cottages can be rented for shorter periods such as a long weekend, mini break or mid week stay. Directions from Dublin Airport: Travel Time by rd Approx 3 hrs, Approx 130 miles Exit Dublin Airport following signs for M1 Motorway. Take M1 Motorway south towards Dublin exiting at the M50 junction and proceed south on the M50 Motorway. Exit M50 Motorway at junction 7 following signs for THE WEST (N4,N5,N6). Continue forward until you arrive at the town of Longford. You will need to go into the town of Longford to proceed further West on the N5, road may be signposted WESTPORT which is the final town at the end of N5. you will cross the River Shannon to the west of Longford and road quality will generally deteriorate after this. The next town is Strokestown, you will need to turn left at the roundabout in the centre of town. Proceed straight on the road with no deviation until you reach the town of Ballaghaderreen. In Ballaghaderreen, at the top of the town after the road swings left you will need to turn right to continue on the N5. At this point you are approx, a half hour away from the cottages. Continue on N5 bypassing the town of Charlestown and arrive on bypass on the outskirts of Swinford. Turn right off the bypass and enter the town of Swinford. At bottom of town pass underneath the railway bridge in direction of Foxford/Ballina. Approx 2 miles out you will pass the River Moy. Approx 1 mile further on after a straight stretch on the road you will need to take a sharp turn to the right. ( At this point there may be a road sign pointing to the left saying TOOMORE), at top of hill turn right and the entrance to the cottages is down about 100 yards.